Refrigerants are under high pressure, may displace oxygen in the room and when exposed to high temperatures may break down into poisonous gasses. If you are not confidant, do not continue. This section covers charging of the air conditioner. Charging of the air conditioner is probably the hardest of all the operations involving the air conditioner. Charging is critical to the efficient and trouble free operation of the air conditioner. I will be covering the different methods of charging the unit depending on the type of system and the components. When beginning the charge of the air conditioner, you must allow the system to come into balance. When the unit is off, the refrigerant migrates to two places. The coldest place and the place that has oil. Refrigerant has an affinity for oil. So the refrigerant will migrate to the compressor oil. Some units have a crankcase heater to drive the refrigerant out of the compressor. Refrigerant in the compressor oil will dilute dilute the oil and reduce its ability to lubricate. In any case, the system will need to distribute the refrigerant so there is enough to fill the condenser and evaporator to their proper level before it can operate efficiently. When the system starts running, it takes between 10 and 15 minutes or sometimes longer to balance the system. The video below gives an idea of how this works. It is best not to begin charging until the system has balanced. When charging an air conditioner that uses a fixed orifice device, the charge is critical and must be very accurate to achieve the highest efficiency and long durability. 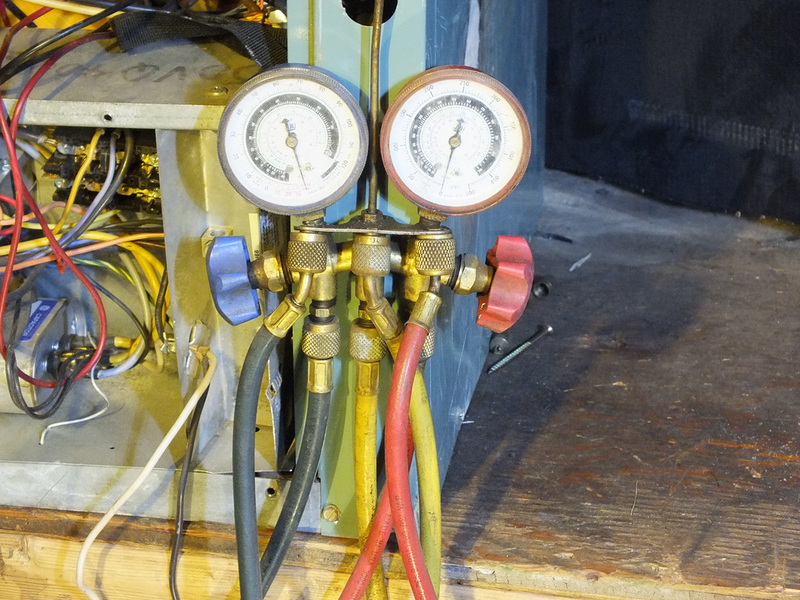 Even the liquid refrigerant in the high side hose of the manifold gauge set may affect the charge level. If you pump down the gauge set into the low side, you could affect the charge level. The video below shows the effect of pumping down the gauge set. Charging by weight is sometimes the best and most accurate way to charge the split air conditioning system. The factory gives a specific weight that the unit comes with. This charge may be the proper amount of charge for the unit if the system has matched components, the line set charge is included and, if an oversized drier has been installed, the excess size has been accounted for. However, not all systems are matched and from the same manufacturer. The video below shows a system that is not specifically matched, but the system does respond well to the factory charge. When charging an air conditioner, you must know what type of expansion device the system uses. This information will tell you what method you should use to determine the correct charge. The video below uses a fixed orifice expansion device. When charging a unit that has a TXV expansion device, the unit is charged by weight or sub cool. Superheat is not used, as the superheat is set by the valve itself. Subcool is measured on the liquid line as it leaves the outdoor unit. Target superheat is a method of charging the fixed orifice device air conditioner to get the highest efficiency with the system components and airflow you have. There are charts to guide you or some digital gauge sets will calculate target superheat for you based on indoor wet bulb and outdoor dry bulb temperatures. The video below explains how wet bulb and dry bulb temperatures are determined. Once you have the wet and dry bulb temperatures, you can either use a chart or the gauge set can calculate the target superheat. The video below shoes how to calculate superheat. The video below shows how to charge the unit using target superheat. I have done a set of videos showing how the fixed orifice device air conditioner can be charged accurately by using your hand on the suction line near the outdoor unit. Your hand senses temperature difference much faster than any temperature probe. These units are charged by superheat. This is not a method of charging for neophytes. It requires experience and knowledge. It also should be used in conjunction with weight, manufacturer's instructions (if the indoor coil and outdoor unit are matched), and target superheat. The video below covers charging by the hand on the suction line with lower air flow. The video below shows charging the air conditioner using your hand with lower ambient temperatures. The amount of airflow across the indoor coil effects suction pressure and temperature, and also effects head pressure and temperature. Higher airflow will increase suction pressure and temperature due to the added BTU of the air passing over the coil and will reduce the temperature split across the coil. The larger number of BTUs absorbed by the coil will increase the head pressure and temperature also because it must move the higher BTUs absorbed by the indoor coil. The video below shows the effect of the different airflows. High indoor ambient temperatures can affect how air conditioners operate. The video below shows the effect of different air flows at high indoor ambient temperatures. The video below covers charging a water source heat pump.